I like the WiFi. I like the price. 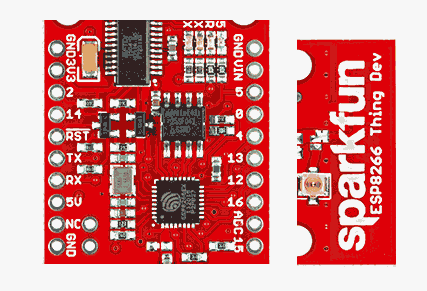 I've written more about why I like the Sparkfun ESP8266 "Thing", and how to get started with it. Many readers will, I suspect, be familiar with the Arduino. The "ordinary" Arduino has an LED on "D13", on the Arduino's PCB. This can be handy, as many projects need at least one LED to display some status information. But it also "limits" the wonderful flexibility of the device, by "confusing" the "purity" of the "theoretical" device. In a very small way, and quite worth the price, in my view, but it does. The designers of many little boards like the Arduino, including the ESP8266 "Thing" choose to "limit" pins in ways like this. Sometimes the limitations are trivial, sometimes not so trivial. I'm not an uber expert ESP8266 user... or even an uber expert Arduino user! "Pin" and signal names, as you read about them on the internet give me a BIG HEADACHE. In what follows, if I say "D5", I mean "the thing" you would affect if you used "setmode(5,OUTPUT);"
D5- 5: This signal has an LED on it, in the Sparkfun board. A0- ADC: This is where you connect analog inputs to he board. They should not be more than 1.0 volts. D16- 16: This behaved a bit strangely when I tried to use it in some early projects. A third party shield PCB labels that line "EN", as in "Chip ENable"... but I suspect that the "EN" label may have been a scrap of a transfer from another project. Though my problems happening to be with that pin may be an indication otherwise. See also note below about "Deep Sleep". D12, D13, D14, D15/ 12, 13, 14: For SPI signals MISO, MOSI, SCLK (SCL), CS, respectively, pp Sparkfun page. Also from the Sparkfun documentation: "The MISO, MOSI, SCLK, and SPI pins are hard-coded and can't be moved." But, I wonder, if you aren't using SPI, can you use those pins as general, un-"special in any way" I/O lines? (I think you can.) (Were the first to SPI signals named by someone who really hated lysdexics? "Sleep-EN" jumper to set this connection up. For now. Comments, corrections, suggestions for more info that belongs on this page (please say "esp8266-pins.htm"!)... WELCOME!